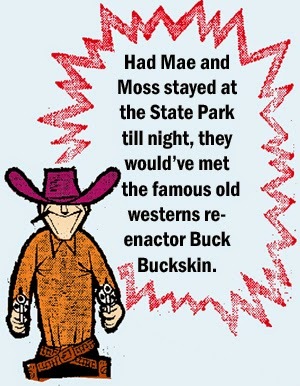 I'm hoping to ride this idea to fame, riches, and glory -- the lives of Mae Healy and Moss Stipple. I've already heard from a friend of mine, saying leave it alone. There's "big interests" out there, his words, who've cornered the market on great ideas, and apparently they'll do their damndest to keep small fry like me from horning in. I, however, refuse to give in to such threats. I feel I have as much a right to express myself as anyone. OK, I'm leaving all my fears of the syndicate (paranoia) behind and I'm simply going for it. Not another word about it. Mae Healy appeals to women readers, Moss Stipple to men. I've heard from enough of you to know where your allegiances lie. So I will address both characters, their development thus far, and some of the story lines I've already thought of. Ladies first. Mae Healy. Mae is a dear old soul who wouldn't hurt a fly. She was once married to a man now deceased, Mr. Healy. She was his faithful partner through thick and thin. They had the same problems other average folks have. But Mr. Healy, being a competent man, was able to provide, thanks to his job. Mae did the honorable thing as his helpmeet. They had children and were very happy. At some point he died. Enter Moss Stipple. When Moss turned 70, he sold his grandparents' old half acre and their deteriorating house he'd lived in most of his life. He looked for another place to live, and ended up as Mae's boarder. Though they lived together -- man and woman without marriage -- it was all quite innocent, no hanky panky. That's the story so far. But they need to have some adventures, to make things more interesting. With most of them being, no doubt, on the tame side. I don't think it'd be plausible to have them suddenly become world travelers, crime fighters, etc. But it would be plausible that they might take a trip to the big city together or to a State Park for a picnic. That's a great idea, so that'll be the first one, a picnic! One day Mae said she'd seen enough of these four walls. "The walls are closing in on me!" she declared, not usually given to complaining, but this day -- whether it was biorythms or simply bitchiness -- she'd had enough. Moss sat in his easy chair, startled at Mae's blunt eruption, it being out-of-character for someone generally so docile and well-pleased. He lay his newspaper aside gently and gave Mae his undivided attention. "Is there anything I can do about it?" "I don't know what it might be," she snapped, "I'm trapped 24/7, confined, like a circus animal dying in its cage." Moss wanted to dismiss the tirade, but instead considered it silently, thinking it indicative of something going on in the older woman's spirit. He thought back on the cases he'd known over the years, of his own Grandma's occasional outbursts and how Grandpa would handle her. Of course he had scant minutes to come up with something before Mae blew her top. "We ought to go to the State Park," he ventured. Just the thought of something like that brought a smile to Mae's face. And her old radiance was back. In a flash, then, she was up, preparing a picnic basket. The State Park was lovely that day, with picture-perfect weather, like the weather we used to have -- not too hot, not too cold, no global warming, no melting icebergs. They drove to the campground area, knowing they could use a picnic table without paying the camping fee. Policies were very lax in those days, before all the current moneygrubbing when it comes to state parks. Mae was the picture of delighted health, and Moss wasn't too shabby either. Mae wore a nice sheer scarf, Moss his cap. A gentle breeze off the lake refreshed them, and moved the hair at the edges of her scarf. She hadn't looked this great for decades. As for Moss, he was able to tilt his head back with abandon and roar out a laugh of delight. 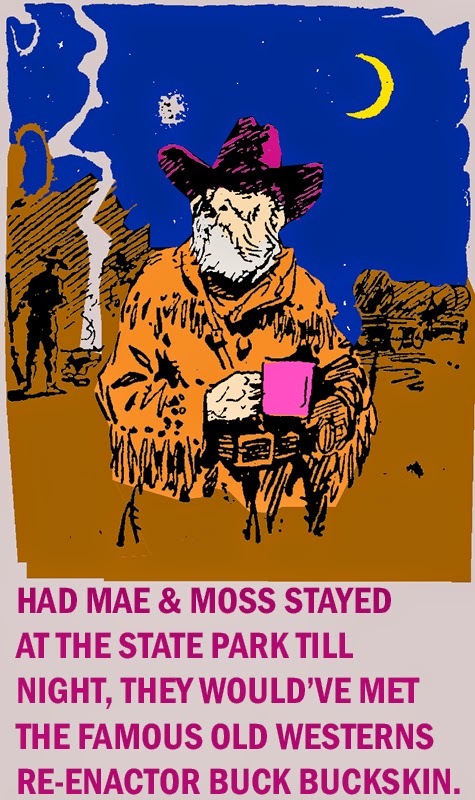 They shared in conversation, Mae remembering how she and Mr. Healy used to camp here early in their marriage. "We had a tent in those days and it rained cats and dogs. You couldn't touch the canvas or it'd run right through. But you couldn't move without touching it. We were drenched, but got to the car and made it home. Mr. Healy looked like a drowned rat! And I didn't look much better!" "What about the tent and your things?" Moss asked, laughing at the ancient predicament. "We came back the next day and got everything! No problem!" Moss had a story of his own. Involving one of his pet peeves from 30 years before. "I was on the other side of this very lake, fishing. And some guys showed up and ruined it for me, with a boom box, playing it loudly. In those days I had one huge hangup, listening to 'the music of someone else's choosing,' a phrase I used in those days. But these louts kept it going, no matter what. So I packed up my fish and went home." "Good for you," Mae commiserated, "No one should have to take that.."
The picnic, like all good things, ended, and they went home, retiring at the appropriate hour. Not realizing what they missed had they stayed till night.